Earlier this week, we announced integration with SharePoint Online modern lists. Today, we are excited to announce the support for SharePoint on-premises lists! You can use a single gateway to create connections to any number of on-premises data sources. The gateway can be deployed centrally and allows you to manage data and helps connect securely from PowerApps, so you can benefit from your existing on-premises data investments without the need to move any data. There are many ways to create and manage connections in PowerApps. In the SQL on-premises blog post, we showed you how to create an on-premises connection in powerapps.com. For this blog post, let’s create a connection in PowerApps Studio. Open PowerApps Studio on your Windows machine and go to “New” tab in the left navigation bar. 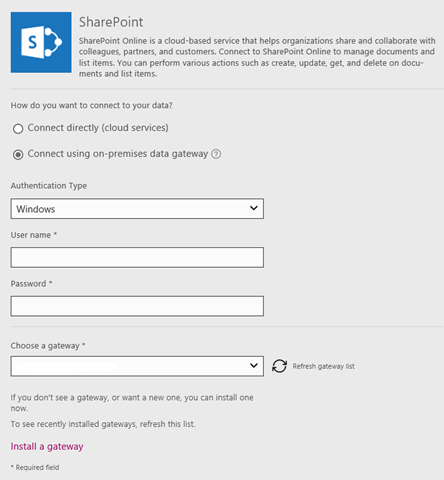 On the next screen, choose “Connect using on-premises data gateway” to connect to SharePoint on-premises. Choose your authentication type from the dropdown and provide you user name, password. We currently support Windows and Basic authentication for SharePoint on-premises. You will also be asked to choose a gateway to create the on-premises connection. If you don’t already have one available to you, you can either contact your IT Admin to install a gateway and provide you access, OR, you can choose to install a gateway yourself. To see more details and learn how to install and configure a Gateway, click here. Click “Connect” to create the connection. Once you have successfully established your connection, you can easily create an app from data for a SharePoint List as shown in our documentation here. We currently support SharePoint versions 2013 and 2016. When you create and share an apps using the SharePoint on-premises connection, the gateway used by the SharePoint connection will also be shared implicitly. Since SharePoint connections themselves cannot be shared, the users of the app will get access to the data gateway so they can create their own connections to SharePoint on-premises and use the app. You can manage permissions on connections and gateways at powerapps.com. We would love to hear feedback from you on this new feature. Does this meet your requirements to connect to SharePoint on-premises? What are the other on-premises data sources you want to connect to? We are continuously adding new features and functionality and your feedback will help us prioritize our work! Please reach out to us via the PowerApps community site. You can also share your feedback from within PowerApps using the “Send feedback” button in the upper right hand corner next to your name. We look forward to hearing from you!